How does frame-shift mutation not absolutely ruin the organism? I'm a bit curious as to how frame-shift mutation works. If you shift one amino acid towards another. How does this not affect the entire chromosome? Wouldn't this mean that the organism would be absolutely "scrambled" as it would essentially be "missing" a whole chromosome...Or having a chromosome that did all kinds of wrong things at least? For transcription, the cell uses different signals from start- or stop- codons to determine the start and end of a transcript (see this wiki page). Codons (and hence frameshifts) are only relevant at translation of the mRNA to protein. Frameshift mutations occur in coding sequence, so the promoter and termination signals for transcription are unaffected. Genes which are further downstream will be transcribed normally from their own promoter and their coding sequence is still in-frame with their own start-codon. When a frameshift occurs in coding sequence, the genetic code downstream can indeed be considered 'scrambled', much alike random nucleotide sequence. In random sequence, three nucleotides have a 3/64 chance of being a stop codon. So one would not expect translation to go on beyond about 20 amino acids from the mutation. Additionally, non-sense mediated mRNA decay will detect these premature stop codons and destroy the mRNA. First of all, for a frame shift mutation to occur nucleotides (not amino acids) are either deleted or inserted into the sequence. Read about details on this wiki page. Here's an image about frame shifts. On panel A a new stop codon is formed (TAG is trasncribed to UAG that is serves as stop codon during translation) thus the result is an abnormally short protein. On panel B the codon 37 is swapped to a G thus the TA from the codon 38 is shifted left by two resulting in the new codon GTA. On panel C exactly 3 nuleotides are deleted thus codon boundaries do not change, but a codon and the amino acid encoded by it is completely deleted. 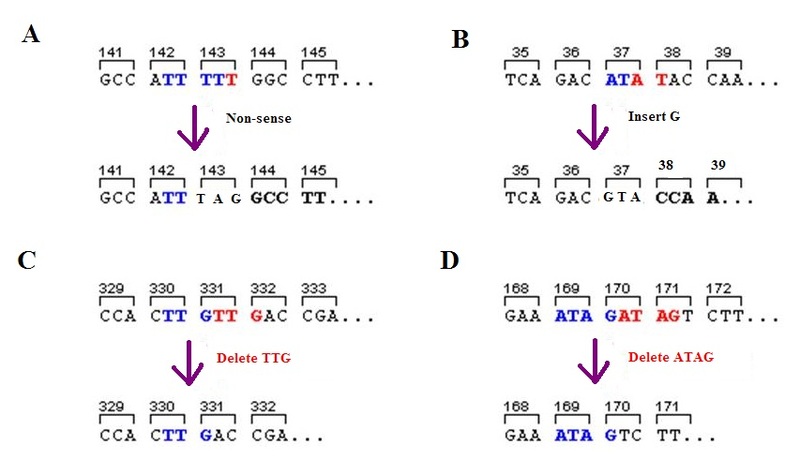 On panel D 4 bases are deleted thus the T form codon 171 and the C from 172 are merged with the G from 170.
source: the linked wiki page. It does not affect the choromosome in the way you describe because genes are separated and are independently transcribed (with some simplification). Every gene has its own translation start that determines the correct frame in that gene If you think of a chormosome as a chapter of a book and the genes are paragraphs, you can see that deleting letters or words may scrable one paragraph, but the others are not affected by this because they have their own boundaries. EDIT: During translation the ribosome reads the mRNA in the form of triplets. When a single nucleotide is deleted then the whole sequence from that point shifts to the left by one thus the first letter of the subsequent triplet gets mixed into the frame where the mutation happened (the same goes for insertion but the sequence is shifted to the right). This causes the change in the meaning of the triplet, and can ruin stop codons that would affect the translation of the mRNA but not the transcription of the gene to mRNA.It is important to understand that transcription is a countinous process and the DNA is transcribed from base to base not in triplets, and that transcriptions stop is not encoded in the from of stop codon. Genes are translated independently of one another. The ribosome starts translating at a start codon (ATG) and stops at one of the three stop codons (TAG,TAA and TGA). Whether another gene has a frameshift mutation or not, does not affect the current gene in any way. The ribosome will always1 start at the ATG and stop at the STOP codon. While a frameshift might throw the first gene out of sync, the second will not be affected. The intergenic regions are not translated, so frameshifts are irrelevant to them. So, a frameshift will only affect the gene it occurs in. 1 There are some exceptions to this, some alternative start codons but they are not really relevant to the discussion here. What organs are absolutely needed by the human body? How does gene expression work in an adult organism? Is everything encoded everywhere? What is the difference between chloride shift and Bohr shift? Does cellular/organism death happen to enable evolution? Does a mutation in the sense strand of a particular gene affect the polypeptide formed?